After more than a year in home video limbo, Gunsmoke is back for another season, its tenth (1964-65), halfway through its 20-year run, and with the promise of an eleventh season release before 2014 is out. This season's two-volume set finds the Western television drama at the crossroads. Much-loved co-star Dennis Weaver, as almost-deputy Chester Goode, was gone, having made only a few appearances before his never-explained departure during season ten. Quint the blacksmith (Burt Reynolds) would make a handful of season ten appearances and likewise vanish. But the series was shifting about in other respects. The biggest change is that Gunsmoke's co-creator, writer John Meston, would leave the series at the end of this season. He'd written 183 episodes of the radio series that preceded the TV show, and for that he wrote or co-wrote 196 episodes, the vast majority. His departure was a major loss. Dramatically speaking, Gunsmoke was also changing quite a bit. The switch from a half-hour format during 1955-61 to an hour format from the fall of 1961 forward gradually altered the program's focus. 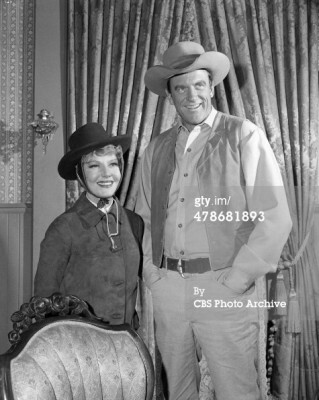 In the half-hour version, stories almost always revolved around Dodge City's Marshal, Matt Dillon's (James Arness); Matt's friend Miss Kitty (Amanda Blake), owner of the the Long Branch Saloon; cantankerous Doc Adams (Milburn Stone); and/or Chester, since replaced by illiterate Festus Haggen (Ken Curtis), Matt's assistant and sometime-deputy. These half-hour dramas almost always focused on how one or more of these characters dealt with some kind of external or internal conflict brought about by a visitor to Dodge: a wanted outlaw, an old friend of one of the characters passing through, a dispute between townsfolk, etc. However, when the program switched to an hour, this was effectively reversed. Now the focus was on these other, usually one-shot characters played by guest stars. Matt, Kitty, Doc, and Chester/Festus were more on the sidelines, with the guest characters conferring with one or more series stars for advice. Sometimes there would be medical issues requiring Doc Adams's services, other times there would be a legal dispute or criminal act compelling Matt to step in and help resolve. A few show do, however, continue to focus on our leading characters. Partly the switch was necessary, as this was back in the day when a television season meant producing thirty-six 50-minute shows, a daunting schedule impossible to imagine today, and which would have been unsurmountable had star Arness been central to the majority of episodes. The switch to the hour format did make room for richer character development and a greater sense of a larger Dodge City community, a bustling populace of three-dimensional characters. But this move also turned Gunsmoke into something of a quasi-anthology series more along the lines of Wagon Train. Further, whereas even the weaker half-hours were usually entertaining on some level because the focus was always on one of the four leads, these later shows rise and fall entirely on the level of the writing. A great script about these one-shot characters and their problems could result in some of the decade's most compelling television, but the handful of bad ones threatened to sour the whole barrel. Fortunately, most of season ten's scripts are way above average and some are outstanding. I've sung Gunsmoke's praises seventeen (!) times before, having reviewed the first season, the the second season, volumes 1 and 2, the third season, volumes 1 and 2, the fourth season, volumes 1 and 2, and the fifth season, volumes 1 and 2, the sixth season, volumes 1 and 2, the seventh season, volumes 1 and 2, the eighth season, volumes 1 and 2, and the ninth season, volumes 1 and 2. These latest volumes, The Tenth Season, Volume 1 and The Tenth Season, Volume 2 include 18 episodes in each set, spread across five discs per. Two unusual visitors to Dodge: Jean Arthur and Betty Hutton. The season is perhaps most notable for two big-league guest stars making rare television appearances. The effervescent Jean Arthur retired from films after co-starring in Shane (1953), the second of only two films in a decade. The Gunsmoke episode "Thursday's Child" was her television debut, and though she was nearly 65 at the time she hadn't changed all that much, her distinctive voice intact. The episode, with Arthur cast as Kitty's mentor, a woman secretly planning to deliver her outlaw son's baby some miles outside of Dodge isn't all that special but it's great to see Arthur still at it and in fine form (and her appearance here may have prompted the short-lived The Jean Arthur Show, her last work as an actress). Robert Lewis wrote that episode, imaginatively directed by the great Joseph H. Lewis. Less successful but even more fascinating and bizarre is "Bad Lady from Brookline," featuring Betty Hutton, the fireball singer-star of such classics as The Miracle of Morgan's Creek, Annie Get Your Gun, and The Greatest Show on Earth. She made her last film in 1957 but continued working in nightclubs, on the stage and in television. But after the failure of The Betty Hutton Show (1959-60) she worked only sporadically. Gunsmoke was her penultimate screen credit, with only a strange appearance on a 1977 episode of Baretta to follow. In "Bad Lady from Brookline," Hutton plays a mother from back east who learns that her husband in Dodge is dead, having been killed by Matt's posse. Determined to eventually kill Matt for the deed, she gets a job as a singer at the Long Branch. At first her prim and proper style seems like a terrible fit, but she adapts quickly and becomes a sensation. Written by Gustave Field and again directed by O'Herlihy, this oddball episode can't decide if it's a comedy or a drama, made worse by Hutton's uncertain performance. She was suffering from depression and an addiction to pills at the time; she was only in her early 40s but looks a good 15 years older (in some ways worse than the 65-year-old Arthur), and nothing like the Betty Hutton of old. She slurs her speech in several early scenes, though as the reimagined Long Branch saloon singer she does belt out a song or two in her familiar style. 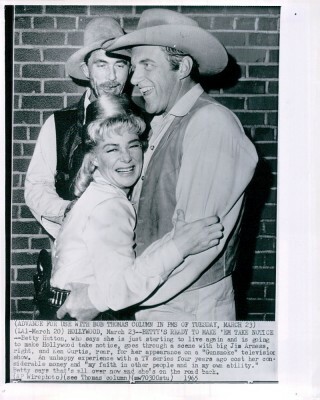 Probably the best of season ten's episodes is Meston's last-ever Gunsmoke script, "He Who Steals," directed by Harry Harris. The show's premise is familiar but its handling anything but. Russ Tamblyn guest stars as Billy Waters, a bored ranch hand impressed by the old-fashioned attitudes of buffalo skinner Jeff Sutro (Harold J. Stone). Billy leaves his job to partner with Sutro, unaware the older man's personal code of justice is starkly at odds with the more civilized West he now inhabits, leading to the lynching of an innocent man Sutro wrongly condemns as a horse thief. Stories like this generally romanticize the older role model and lack subtlety when he's later revealed as flawed, while the youth is typically a wide-eyed innocent too naïve to see the obvious. Here, however, Sutro is depicted as immensely unlikeable to all but Billy, who sees what others do not, a throwback to a wilder West he finds attractive. Former child star Tamblyn was 30 and by this time losing his boyish features, though these still peek through a more worldly face. He recognizes that others aren't likely to sympathize with a sanctimonious bully like Sutro, but tries to anyway, though Sutro's proclivity toward violence increasingly tests this loyalty. Both actors are excellent, particularly Tamblyn, who was sometimes disengaged from material he didn't believe in. Here, however, he's captivating, leading the viewer to wonder why he never became a huge star. Other than that, it's business as usual. Guest stars include (in Volume 1) semi-regulars Glenn Strange, Hank Patterson, Roy Barcroft, and others; also Karl Swenson, John McLiam, George Kennedy, Royal Dano, Katherine Ross, Ned Glass, Denver Pyle, Michael Pate, James Broderick, Harold Gould, Jack Elam, Robert Culp, Elisha Cook, Edward Asner, Scott Marlowe, Richard Anderson, J.D. Cannon, Mariette Hartley, Glenn Corbett, Gigi Perreau, L.Q. Jones, Bethel Leslie, Jason Evers, Michael Forest, Jeanette Nolan, Dyan Cannon, Frank Cady, John Fiedler, Forrest Tucker, Burt Brinckerhoff, Ted Knight, Don Beddoe, John Drew Barrymore, Dennis Hopper, Anne Helm (and in Volume 2) Victor Jory, Robert Loggia, Walter Burke, Warren Oates, Theodore Bikel, Lee Majors, James Hampton, Harry Carey Jr., Eileen Heckart, James Whitmore, John Saxon, Darren McGavin, Everett Sloane, Aneta Corsaut, John Dehner, Steve Ihnat, Lee Van Cleef, Jan Clayton, Andrew Duggan, John Hubbard, Harry Townes, Rory Calhoun, and James Gregory. Still in glorious black and white, Gunsmoke looks better than ever on DVD. The graininess of the early seasons is gone, replaced with an extremely clean, sharp image throughout. The 18 black-and-white episodes on each volume are spread over five discs each, with a total running time of about 16 hours per volume. The Dolby Digital mono (English only) is clean and clear, and the shows include optional English SDH subtitles. The packaging allows viewers to read the episode descriptions inside the snap case. Two more terrific rounds of great Western drama, Gunsmoke's tenth season volumes aren't cheap, but provide many hours of quality entertainment worth the price. A DVD Talk Collector Series title.